A couple of weekends ago Cheryl and I were in San Francisco for a wedding and we were reminded of many good memories from our joyous day. My thoughts usually end up thinking about our honeymoon and inevitably about what we ate. I’ve previously posted about a cooking class Cheryl and I took while on our honeymoon in Barcelona (see Sopa de Tomate) and how much fun it was to bring back the recipes that would always remind us of that trip. Last week green peppers were on sale so I decided to make a Spanish Tortilla, which was one of the recipes we came back with. It’s something you can find in pretty much any café or tapas; they had especially large tortillas at the food stalls in La Boqueria, and is a great snack any time of the day. Making a Spanish tortilla requires a little more extra work than an omelet but is totally worth it. 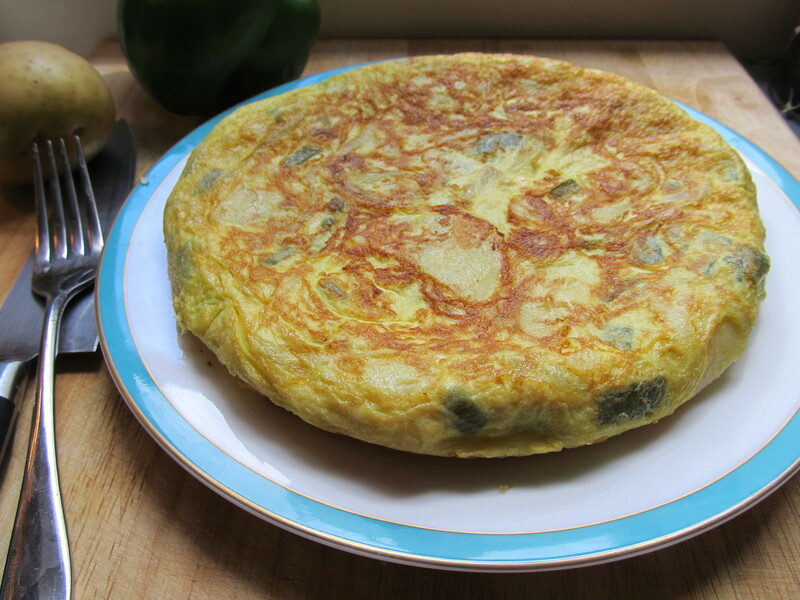 A Spanish Tortilla is similar to an Italian frittata but instead of finishing the dish in the oven you turn the pan over onto a large plate and slide it back into the pan to finish cooking. It’s a great dish for a brunch, light dinner, or just an afternoon snack. There are different kinds of tortillas but the most basic one you’ll find has potatoes and onions. Our instructor in Barcelona put some green peppers in his tortilla and said his mom always used green ones instead of red because it gave the tortilla a more pepper flavor. There are no green peppers in the recipe we brought back but I always remember him saying this and put them in when I make one. I have to agree, the green peppers just seem to go better with eggs than red ones. There’s just something about the combination. He also seasoned the potatoes before putting them in the oil to cook instead of after so the potatoes absorb the salt and are seasoned. Just another lesson learned, which I suppose is the whole point of a class! I like using waxy potatoes in this recipe since I think they hold up better in the oil and don’t get as mushy as starchy ones. Splurge on the Yukon Gold ones. You’re going to be tempted to use more eggs, but don’t succumb! It will just take longer to cook and you may end up with an undercooked middle and overcooked exterior. The tricky part which takes a few attempts to master is flipping it over. Not overly difficult but you need to be quick. The first time I tried it there was egg leakage everywhere. Now, hardly any! Let it cool, slice into wedges and serve as a snack with some white wine, cava, or an Estrella. Salt the potatoes. In a large frying pan combine the salted potatoes with 2 C of the oil. You want enough oil to just about cover the potatoes. Place over medium-high and fry. When the potatoes are about halfway cooked, add the onions. Leave over medium-high heat until cooked and tender and onions are limp. The onions will reduce by about half. Drain potatoes and onions and spread out on paper towels to absorb oil and cool slightly. Beat the eggs in a bowl. Mix in the cooled potato/onion mixture. Heat a non-stick pan (the best option, trust me!) over medium-high heat, add a little oil if you want (I do) and pour mixture into pan. Give it a shake to evenly distribute the egg mixture. Cook until the bottom begins to brown and the top begins to set. Now the tricky part. Take a plate or pot lid which is larger than the pan, remove the pan from the heat, and cover the pan with the plate/lid. Try to get a plate/lid which is fairly flat. Holding the plate/lid in place with one hand, flip the pan over so the tortilla is now bottom side up on the plate/lid. (Do you have excess liquid egg all over the stove? Good! Don’t worry, it’s going to happen.) Slide the tortilla back into the pan so the uncooked side is now facing down. Finish cooking over medium heat. Allow to cool and cut into wedges to serve. Just had to share this recipe from The Roaming GastroGnome for one of my faourite things about Spanish food. You just can’t beat a freshly cooked Spanish tortilla. Great for any meal, super quick and can be eaten hot or cold. If I do this for dinner hubster always takes the leftovers to work for lunch. That’s one of the best I’ve seen…. very inspiring!! What a great light summer dinner!